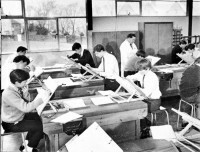 1963 Original buildings from launch photos. No fencing around playgrounds as yet. 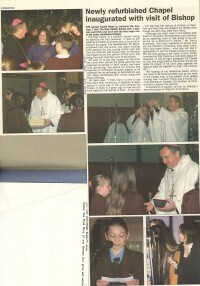 2004 Re-dedication of chapel after refurb. 1962. 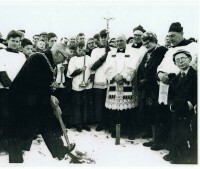 Lifting the first sod at Holy Family. Priest on front row, without biretta is Canon Francis Holdright, one of (if not the prime) the driving forces to establish a Catholic secondary school in Keighley. Fr Creed to right. Crucifer Frank Sheridan. Mayor and Mayoress are likely to be Mr & Mrs Gallagher. 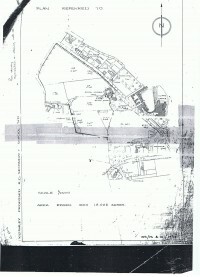 Supplied later: Bitterly cold winter, the ground was frozen solid and the Mayor did little but scratch the surface. I was a small child, behind lots of adults and could se what was going on, so insisted on inspecting this (legendary) first sod before leaving. A big disappointment!